St Patrick's Day Races are over for another year. If you are interested in the race results, you can find them at www.racingnsw.com.au. Here is a direct link to the Broken Hill race results for 16 March 2013. 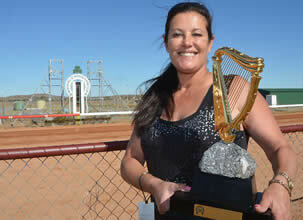 Port Lincoln trainer Annette Morrison trained the winning mount 'Tresette' a gelding foaled in September 2005. There were 8 races. Race 6 being the main race, an Open Class 1600 metre race with a $47,550 first prize. I couldn't make it this year, hopefully next year. We would love to hear how you enjoyed the day if you went, or how you enjoyed the recovery day at Silverton on Sunday the actual St Patrick's Day. If anyone had a go at 'Two Up' at The Palace Hotel on Saturday night, feel free to tell us what the atmosphere was like. Would you play again?